I got some fabulous kitchen goodies, so you know what that means! NEW RECIPES! I’m happy as a clam with my new KitchenAid hand mixer, my new Cuisinart food processor and a few other fun things. They’ll be making their appearances in my recipes in due time. I also got a nice gift of one HaloTherapy session to the Salt Cove – it’s a new-ish place that hosts Halotherapy rooms – basically, the room is filled with Himalayan sea salt and is heated to a temperature warm enough to engage the flow of negative ions. Sounds counterintuitive, but negative ions are actually a good thing. To keep it simple, ions are invisible charged particles in the air. Back to middle school science class, some molecules are positively or negatively charged. If one loses one or more negative ions, it becomes positive – the more negative ions, the greater the negative charge. Negative ions are found mots abundantly in nature… some of people’s favorite places. Have you ever gone to the beach and just couldn’t tear yourself away? Have you ever walked through a forest, took a huge breath, and just felt really energized? Trees, bodies of water, rainstorms, earthen landscapes… welcome to the land of negative ions. If you’re stuck in an office filled with hundreds of computers, cell phones and Bluetooth devices like myself all day, finding a place like this is a real treat. I highly recommend you check out one in your area – they’re popping up all over the map! It’s a great place to meditate, clear your mind and enjoy some relaxation. Back to food… while I have been doing my darnedest to stick with the paleo grind, I couldn’t help myself with Christmas. I made the most delicious Potato Gratin… for those of you who can appreciate a little starch and a lot of flavor, please check this out J I will have some healthy recipes back on deck for you guys later this week… stay tuned! Preheat the oven to 400 degrees F. Lightly grease a large but shallow baking dish with some ghee and set aside. In a large saucepan, combine the potatoes with enough water to cover by 2 inches. Bring to a boil and cook until fork-tender, 20-25 minutes. Drain well and transfer to a large bowl. Mash the potatoes, along with 4 tablespoons of the ghee. Add the crème fraiche, parsley and chopped sage. Once mixed evenly, mix in the fontina and season generously with salt and pepper. Spread the potato mixture in the prepared dish in an even layer. Separately, in a small bowl, use your fingers to blend the rest of the ghee with the breadcrumbs and Parmesan until the mixture becomes crumbly. Add a pinch of salt if you feel the mixture needs a bit more flavor. Top the potatoes with the breadcrumb mixture. Bake for about 30 minutes, until golden and crisp on top. Meanwhile, as the gratin bakes, heat olive oil in a small skillet until shimmering (but not smoking!) Add the sage leaves and cook until crisp, in both sides, about 1 ½ minutes per side. Transfer the sage to paper towels to drain. Once the gratin is finished cooking, scatter the fried sage over the top and serve. Such a heart-warming time this last week, especially approaching Christmas. My Adopt-a-Family gift drop-off for work was a few days ago, so I loaded my Jeep up along with several other cars and we dropped off 10 very large bags of gifts to Family Promise, a local chapter of a non-profit that helps families get back on their feet by providing affordable housing and life skills/coaching as they work to improve their situation. I may have gone a little overboard in buying things myself for them — I picked up the unclaimed items on the list, found myself at Old Navy with their huge sales… and bought these little girls the cutest outfits, shoes, scarves, hats, gloves… I just wish I could be there to see them open everything. I hope they love it all. Does anyone else feel a little unraveled? I know the holidays are always really busy, and I know i always feel like I’m one “Issue Notification” email away from a mental breakdown at work, but I’ve been feeling particularly frazzled this year. I leave for work, it’s dark. I come home, and it’s been dark. Do you know what I’ll be doing this weekend? It stands to reason that this probably won’t be a total truth, but I plan to do as close to nothing as possible. My current definition of “nothing” is listening to Christmas music, with my dog, wrapping Christmas presents and going to bed at 9pm. I’m so excited. I’m also excited to have some more time to cook things for you all! I’ve concocted a ton of recipes, it’s just trying to find the time to make them. I’ve been so busy that I’m living off of chopped salad and scalloped potatoes I made, and have kept in my fridge. Whatever! Yolo. A simple reminder for this Holiday Season, don’t forget about yourself. There’s a fine balance with gift giving, and just general giving, which includes your time, your home, and even your thoughts. Don’t forget to give yourself some peace and quiet — you don’t have to accept every holiday party invitation, nor do you need to gift people the most expensive crazy thing you can find to prove their importance to you. Give from the heart, take some time for yourself, and enjoy the time of year where people are a bit more generous, a bit more forgiving and a bit more kind. In a saucepan large enough to fit all 12 eggs, cover completely with cold water. Bring to a full boil over high heat. Once the eggs have started to boil, remove from heat and let stand for 12 minutes to allow the eggs to cook thoroughly. Run the eggs under cold water to stop from further cooking, then drain. Meanwhile, add olive oil and red pepper to a small frying pan, and sauté until soft and starting to brown, about 5-6 minutes. Stir frequently, so they don’t burn. Once finished, set aside. Gently peel the eggs, careful not to break the whites. Cut the eggs in half lengthwise and scoop out the yolks into a small bowl. Arrange egg whites face up on a plate, and set aside. In a bowl, mash egg yolks, Coconaise, Dijon, red pepper, salt and black pepper together with a fork. Continue to mix until smooth. Transfer the egg whites to a plate and fill them with the yolk mixture. Sprinkle with the jalapeño, add small drop of sriracha and serve immediately. You can cover and chill them for up to 4-5 hours if you need to make them ahead of time. We had our first snowstorm this weekend, and it was kind of fun! I drove home, and it was nice to see the snow covering all of the trees. I think I’m ready for more snow after Christmas… I just need to get through the next three weeks so that I can get my shopping done. Yesterday was a madhouse out shopping. People were everywhere, and the sales were actually pretty good. What wasn’t good was the amount of money I spent… it was painful. It seems as though my list of people to buy for continues to get bigger and bigger, and I found myself getting upset with the fact that I was trying to find just something to buy for people. After talking with people about what the best gift ideas are for big crown, I decided that giving people something that I love, that I also knew they would love, would be the best route. Food, it is! Maybe I’ll make people cookies, or fun dishes and things they can freeze and enjoy later. I haven’t quite decided what I want to do, but I do have a few ideas… They’re a surprise. This past Friday, my best friend and her old roommate came out to my house for reading. It wasn’t meant to be anything grand or spectacular, but I knew there be people to feed and I was excited to throw something together. I made some delicious vegan garlic bread and a salad with some tasty pomegranate Dijon dressing, but the best part about the dinner was the dish that I just threw together with whatever was in the cabinet. I had couscous, a can of beans, and as I dug through my freezer I found some frozen spinach. With my endless supply of onions on hand, I decided to throw it all in a pan and see what happened. Delicious! In a frying pan, heat 1 tbsp olive oil over medium high heat. Add onions and sauté until they start to become translucent – about 5-6 minutes. Add garlic, and continue to stir for another 2-3 minutes until fragrant. Once the onion begins to brown, add spinach to pan. If it hasn’t thawed, lower heat so as to not scorch the spinach as it cooks. Break apart with a spoon and continue to cook, allowing the water to cook out, turning the heat back up once the spinach is completely broken up. Cook for 10-12 minutes, until most of water from spinach is gone. Meanwhile, in a separate medium sized sauce pot, heat vegetable broth and other tbsp of olive oil over high heat. Once brought to a boil, add couscous and allow to cook per directions. Stir to fluff and set aside. Back to the frying pan – add beans and raisins to the pan and mix. Gently stir in the couscous and continue to mix. Add curry powder, paprika, salt and pepper and stir. Continue to sauté for another 5 minutes, until couscous starts to brown. If your mixture starts to dry out, add in a tsp of olive oil while stirring. Feel free to add additional salt, to taste (I find the other flavors mix nicely with this amount of salt, but feel free to add). Enjoy with some thing light – like my Garlic Tahini Kale Salad! 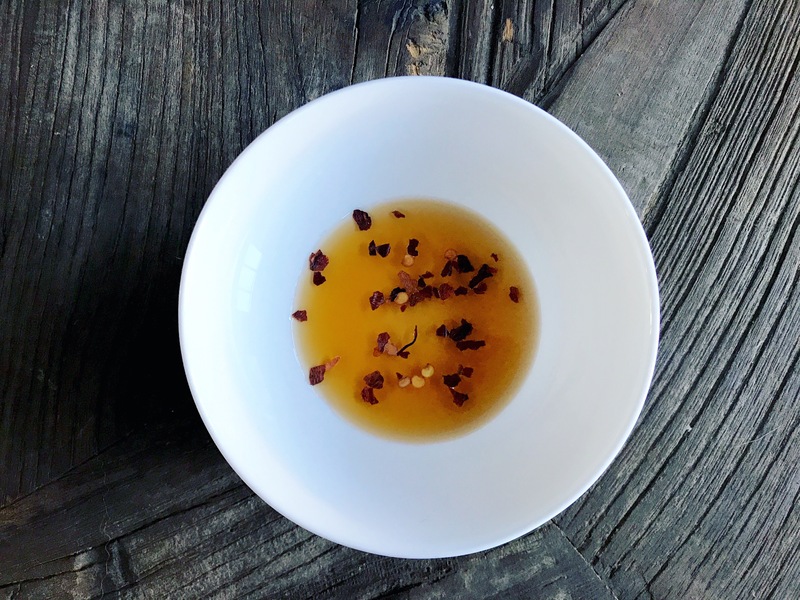 A few of you asked about the chili oil I added to my noodles — this is great on more than just noodles. This stuff keeps for a while in the fridge, so I like to make a big batch… but be careful, it definitely has a bite! Combine grapeseed oil and all but one clove of garlic in a small saucepan and cook over medium-low heat, stirring, until it starts to brown slightly. Reduce to the lowest heat and continue to cook, stirring frequently, until garlic becomes very dark, about 10 minutes. If the garlic becomes quite sticky, this is when you know it’s done. Transfer mixture to a heat-proof bowl and add sesame oil. Transfer to a blender and blend on high speed until garlic is completely emulsified, about 30 seconds. Return mixture to saucepan and add chilies and remaining garlic. Simmer over low heat until chilies and the fresh garlic begins to bubble. Remove from heat and allow to completely cool. Separately, grind half of the sesame seeds in a mortar and pestle until roughly ground. Add to the oil mixture with remaining sesame seeds and sugar and salt – add more salt if needed. Transfer to a jar or container with a lid (preferably glass so the scent does not leech into the container). This can be stored in the refrigerator for up to 2 months. I hope everyone had a fabulous Thanksgiving! Unfortunately for me, I had a really bad cold all of last week so while I did get to eat a ton of delicious food, I couldn’t really taste it 😦 But! that’s no reason to leave some goodies out! Have some leftover potatoes? This is a super easy treat that will impress your guests… because who doesn’t love potatoes? Preheat oven to 400 degrees F. Thinly slice potatoes using a mandoline sliceror food processor with the slicing attachment. Arrange potatoes upright in a 10″ cast iron skillet. In a pan over low heat, add ghee or olive oil and allow to warm. Add rosemary, thyme and garlic and simmer for about 5-7 minutes, stirring continuously to prevent the garlic from burning. Remove from heat and pour evenly over potatoes, using a brush to spread the herbs and garlic evenly. Season the potatoes with salt and pepper. Place in oven to cook for 1-1/2 hours. If potatoes start to brown or burn too quickly, turn the heat down. Likewise – if they appear they aren’t crisping fast enough, turn the oven to 425 degrees F.
Once potatoes are cooked, remove from oven and serve. I have a question for all of you – have you noticed something? There’s been a lot of turmoil lately, just in the air. Not necessarily in my life…. My job is alright, my pony is behaving himself, my friends and family are alright, but the world seems as though it’s in shambles. As I made a few new recipes for you all, an ad came on during a Seinfeld commercial break. It was some guy, Tom Steyer, that Google apparently names as a “leftist CNN-supporting billionaire against Trump”. I don’t claim to support this man – in fact, I only found out who he was a mere 20 minutes ago, and that descriptive quote I pulled was straight out of Google. Without discussing politics, where you stand on the political spectrum, or whose beliefs you support, I just wanted to bring up the concept of moral identity. And as this man’s commercial praised “following your moral compass”, it still carried a morose undertone that I just can’t ignore, even though it opposes a man that ruffles more feathers I can even convey. What makes me think of “moral identity” are two particular old memories that I can’t seem to get rid of. The first of two was an awkward run-in with an elementary school bully. She took issue with me because I was scrawny, and obsessed with horses, had teeth that grew in before anything else on my body, and that I never felt it necessary to defend myself when she poked fun at me. I never needed my friends to defend me, but I also wondered why they never took issue with anything this nasty little girl said to me. Was it the by-stander effect? Were they afraid she might target them? I wasn’t quite sure. Years passed, I haven’t seen her, but it still bums me out that people carry that kind of energy with them where they get their strength by bringing down others. Another time, many years later, I had a class with a girl who never seemed to have the awareness that others might not “jive” with her jokes, her hobbies or social quirks. Was that her problem? Absolutely not, it was ours. Yet, I knew how it felt to have everyone’s eyes on you, everyone waiting for you to take another misstep – I made sure to never say anything mean to this girl, because it’s just cruel. Now, I don’t want anyone sitting here thinking I was some classroom hero – my brief bout of confidence was quickly shattered by my classmates telling me I was overreacting, that they were just kidding, and that maybe I needed the jokes towards myself so I would have thicker skin. It really didn’t feel that way in the moment, though. I truly remember that day like it was yesterday, and it makes me sick. It was really that moment where I drew a line in the sand with myself and what I felt was right vs. wrong, and it established that anything crossing that line was unacceptable to me. By doing so, it was up to me to stand up for something that I felt was morally unacceptable. Do you know what makes me feel that same way? The divisive nature of almost everything I see, on every news outlet, everywhere. This seems idealistic, but I’m just yearning to see more compassion as I look around today. I want to see people helping each other, people acknowledging each other’s best qualities, and respecting each other’s flaws. Should you take a strong stance on any issue, I just hope that you bring it upon yourself to respect, acknowledge, and explore someone else’s opposing opinion before you disregard it. On a lighter note, this recipe kind of signifies “looking at another perspective”, and respecting it as it is. Beans and Legumes are not paleo – in fact, I don’t like to eat beans anyway, because… they’re a bit noisy. But they do have their health benefits, and I know that someone somewhere out there likes them. If you make the portions smaller, you could even make these as an appetizer! If you’re still reading – I’m glad you’re able to respect someone else’s viewpoint if you happen to stand on the other side of the fence. There’s a serious energetic shift going on right now – people are growing tired of the same-old. I truly hope we take this opportunity to put kindness first – I think all of us can use it. In a small bowl, combine coconut cream, pinch of salt and adobo sauce. Once thoroughly mixed, place into the refrigerator to chill and prevent from melting. In a large frying pan, add onion, bell pepper and ghee. Sauté on medium heat until translucent, about 5 minutes. Add garlic and spinach, and continue to cook until onions start to brown, another 4-5 minutes. (do not cover the pan, as you want to allow the water to evaporate out of the spinach). Once finished, remove from heat and set aside. Meanwhile, drain and rinse one of the cans of beans, and pulse in food processor until completely mashed into a paste – you may need to add a pinch of olive oil to keep the mixture from sticking to the sides. Separately, drain, rinse and place other can of beans into a large bowl, and lightly mash with fork. You want to keep about half of the beans in this portion still intact for added texture. Once beans are finished in the food processor, mix both portions of beans together in the bowl, along with almond flour, onion, pepper, spinach, garlic, egg and spices. The mixture, at room temperature, should be sort of thick and sticky, like cookie dough. To make sure it’s easier to form, place in freezer for 15-20 minutes, so that mixture can hold a shape when formed. As the mixture chills, pre-heat your oven to 400 degrees F. Once the mix is removed from the freezer, take a small lime-sized scoop of it, and shape each scoop into a 1/2-inch-thick patty. Roll the patty in plantain chips, ensuring it’s fully coated. Place each patty on a parchment-lined baking sheet and bake for ~25 minutes, or until crust starts to brown. About 10 minutes before the cakes are finished, remove the adobo cream sauce from the fridge, stirring occasionally. I am not a baker. While I feel as though many of my best recipes are desserts, I think it’s because they’re a version of something everyone already likes… with a healthy twist. It’s like getting the best of both worlds. In my attempt to fill my life with as many seasonally appropriate things as possible, I’ve studied Pinterest religiously, and canvassed the house with mums and Indian corn. I bought all of my cans of organic pumpkin puree BEFORE the mad Fall rush, and I have even thought of my outfits ahead of time, according to what sweater I want to wear that day. This last one is a fail because the weather is unseasonably warm, but I am determined to fill the house with smells of fall recipes and pumpkins, and spice. Once the weather cools down, I’ll tackle more fall soups, salads and main dishes, but for now — I will continue my hand in baking. I grew up on carrot cakes, ginger snaps and potpourri, but I never really had a sweet tooth. I’m not sure what happened between then and now, but I really enjoy baking. These ‘lil beauts happened after much trial and error, and after a few rounds of bland muffins, I decided to dump in a bunch of my favorite spices, sub in some pumpkin for apple sauce, and lo and behold, the perfect little breakfast muffin was born. Though they don’t need to be limited to breakfast, I find it’s just enough sweetness with the spice to satisfy. I use unsulphured/unsweetened molasses, which gives them a really nice earthy flavor. I guess, the moral of the story here is that there are things in life that we don’t think we’re good at, but really, it’s just that we don’t give ourselves the opportunity to succeed. If you were to ask me if I’m a great baker, I’d probably say that I’m terrible… a “baking dunce”, if you will. When I think about it though, I should give myself at least a little credit for the things that ended up being pretty good. This can really go for anything. A sport, playing an instrument, singing, etc. A few weeks ago, I decided I wanted to drive a manual transmission. I thought I was always terrible at it — I couldn’t remember the last time I drove one. I got in, drove away, completely forgetting why I thought I couldn’t do it. Sometimes, you just need to remind yourself that you’re capable of whatever you want to do — sometimes you just need to try it. Go make these muffins — they’re a delicious and healthy alternative to normal fall cakes and cookies. Yum! Preheat your oven to 350 F. Grease a non-stick 12 cup muffin pan. You can use liners, but I find they get a nice shape when directly in the pan. In a large bowl, whisk together the eggs, pumpkin puree, coconut milk, coconut sugar, maple syrup, molasses and vanilla until blended. In a separate bowl, combine the dry ingredients – almond flour, coconut flour, arrowroot starch, ginger, cinnamon, allspice, baking soda and salt. Mix thoroughly. Slowly add the dry mixture into the wet mixture until just combined – since the flours aren’t wheat based, allow to set for about 5 minutes so everything can absorb. Spoon the batter evenly into the muffin cups, about 1/2 to 2/3 full. The batter will rise at it cooks. Bake for 18-20 minutes, or until starting to brown. You can test the doneness by sticking a toothpick in a few of the center muffins — nothing should stick to the toothpick. Remove from oven, allow the muffins to cool in the pan for 2 minutes or so before carefully removing them to cool. Optional – if you prefer a more decadent muffin, feel free to mix some leftover coconut milk, maple syrup, pinch of cinnamon, ginger and allspice and drizzle over the top.